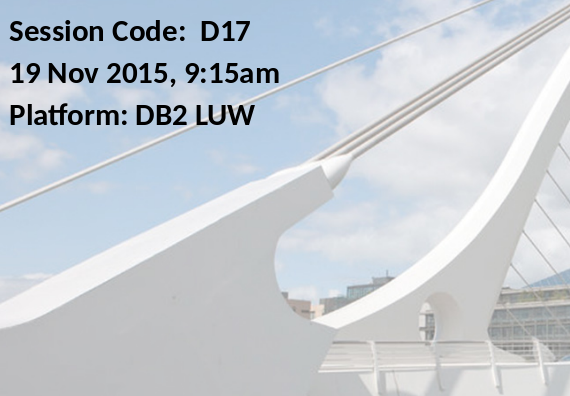 Last week I attended the IDUG DB2 Tech Conference in Dublin, Ireland 2015. It was a week together with 500+ friends, old and new. A week of sharing information about DB2, learning cool new stuff (even as longtime user, developer, consultant, ...), making connections and friends, and bringing back a long list of things to try out back home and dig deeper into. The conference itself started on Monday with 2 tracks each for DB2 on z/OS, DB2 for Linux, UNIX, and Windows, and for application development. Sometimes it was hard to pick a session because there were several interesting presentations in parallel. Even as "friend of DB2" for many years there was a lot to learn, both from users presenting about their experience with DB2 or IBMers sharing latest features, interesting details, and experience from customer projects. I was astonished that even after long days with receptions and dinners in the evening, and not much time for sleep, the early morning sessions were packed with a highly interested crowd. There were lively discussions all the time. Although the conference focused on using DB2 "on premise", there were a couple sessions around using DB2 "on cloud", either as DB2 itself or in its variation dashDB on Bluemix. The cloud offering is interesting for innovation and prototyping projects, for consolidating smaller instances, or as a form of redundant storage. I am sure we will see more sessions and customer stories in the future. A big THANK YOU to all the IDUG volunteers who made this event possible. 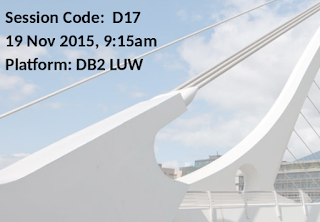 I am looking forward to IDUG DB2 Tech Conference 2016 which will be in Brussels, Belgium. The call for presentations is already open and I highly recommend submitting a session proposal.